Landing pages are critical for growing your online business. They encourage users to buy, generate leads, or even collect information about your prospects. For many businesses, however, landing pages are a struggle. Marketing teams either don’t know how to create landing pages or consider themselves too busy to create them. How Does Unbounce Fit In The Picture? Unbounce is an all-in-one platform, allowing businesses to create beautiful, functioning landing pages that convert. And the best thing is that you don’t need to hire a developer. Their drag-and-drop builder makes it super easy to use. They also offer a wide range of landing page support features, including popups and sticky bars. This review will break down everything you need to know about using Unbounce so you can decide if it is the right fit for your business. Unbounce is a Canadian software company founded in 2009 by Rick Perreault and five other professionals. The business idea came from Rick’s own need. And so, Unbounce was born. Unbounce is a popular choice, but is it a useful tool for your business? At first look, Unbounce looks a bit overwhelming for the uninitiated. There are a lot of features and the learning curve seems like it could be steep. However, after a quick poke around I see all the features are well labeled and documented. There are in-depth features which I likely wouldn’t use off the bat, but the platform seems very intuitive to use. 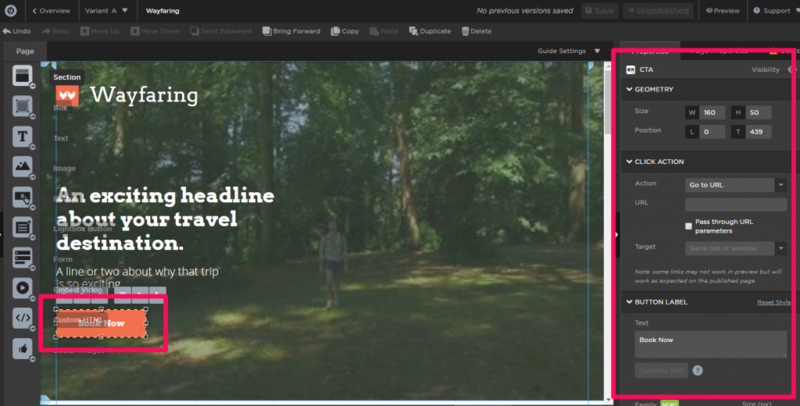 Unbounce’s dashboard – in this instance, a form is being edited. Unbounce offers a three-tiered pricing plan starting at $79 per month if you pay annually. This plan includes 75 landing pages and 8 popups and sticky bars. They also offer a 30-day free trial so you can try it out before you commit to an annual plan. Plan features vary based on which account you choose, of course, but the largest difference is the number of pages you can publish per month. Pro and Enterprise plans also offer integration with other software services, such as Salesforce and Marketo. What stands out most about Unbounce is it is incredibly easy to use. 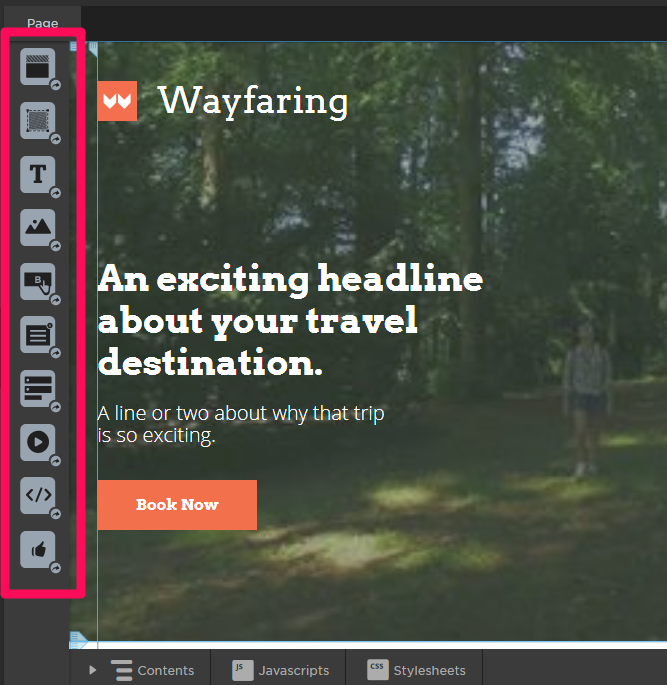 If you have used a drag and drop web builder before, you will be able to manage Unbounce. Sign up for a free trial, then login to Ubounce. Use the green button to create your page. You have the choice to start with a blank page or a template. We will choose a template for this walkthrough. Once you have selected your template, click “Start with this template” in the bottom right corner to begin editing your new landing page. 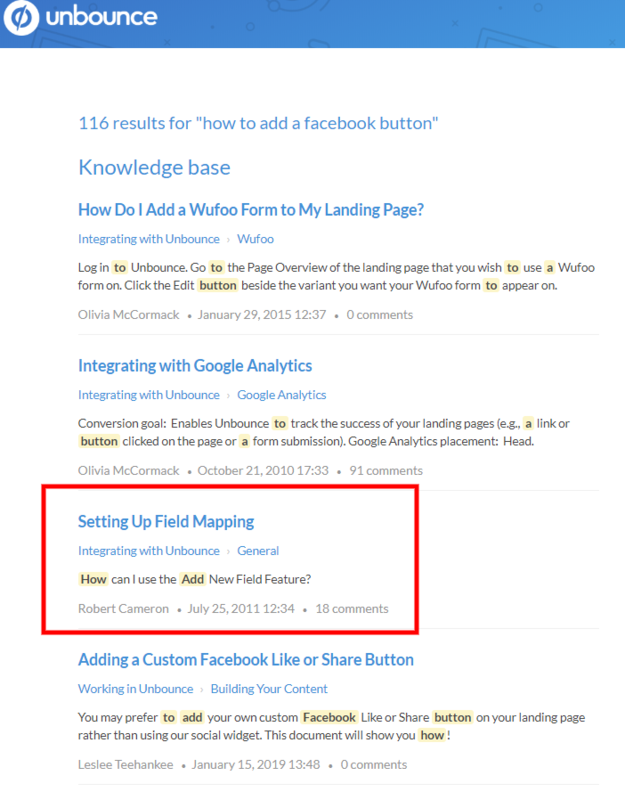 Now, you are in the Unbounce builder. Using the icons in the left-hand corner, you can change the background image, add text, and additional elements. If you aren’t sure what a specific icon does, hover over it with your cursor and a description will pop-up. Use these tools to add social media widgets, embed video, add text, and more. When you click on an item, the ‘properties’ of the item will show in the right sidebar. Editing the button can come across as overwhelming but it’s actually simple. Once you are satisfied with your page, click the blue “Save” button in the top right corner. Click the page name on the left side of the top Nav bar and change it to suit your preference. Since we are using a template and we didn’t change the name, it is the name of the template, Wayfaring. Unbounce offers comprehensive support material online which should help with these processes. Once you’re done and ready to publish, click the blue “Publish” button in the upper right corner of the dashboard. Congratulations – your landing page is now live! What do you get when you choose Unbounce? The specific features depend upon the plan you choose, but the main offering is access to the Unbounce drag-and-drop builder. 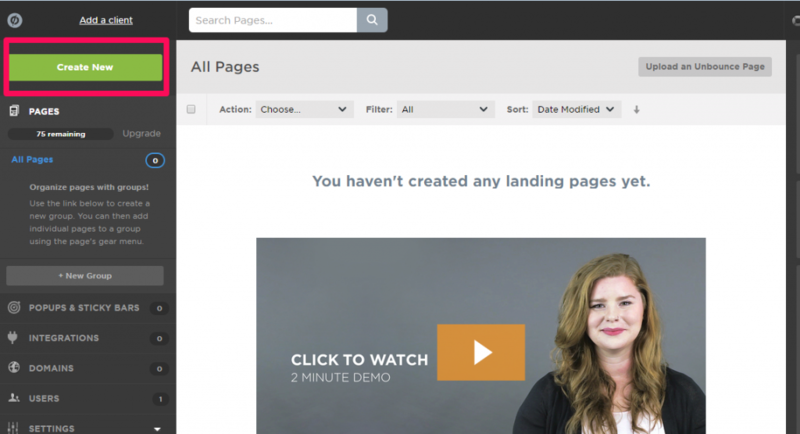 What Can The Unbounce Landing Page Builder Do? 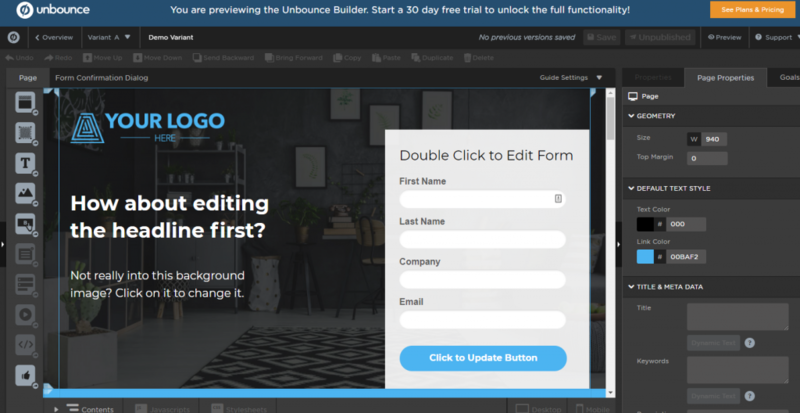 This builder allows you to easily create a full-fledged landing page without ever touching the code. You can add text, buttons, videos, social widgets, and more. Each feature you add can be customized in dozens of way, including adjusting the font, size of text, color, and adding links. You can add metadata, alt descriptions, adjust transparency, and much, much more. It is an incredibly powerful tool that is easy enough for most web-savvy folks to use. These can be expected as standard from all plans, but there is more. Unbounce offers a total of 106 integrations. Further integrations include email tools including MailChimp, Constant Contact, Active Campaign, Campaign Monitor, and AWeber. Currently, you cannot download the reports, only view them. However, if you are an agency looking to provide the tool for clients, you can add them as a “view only” user so they can view stats themselves. All plans give you the ability to A/B test landing pages and sticky bars so you can do more of what works. The A/B test center tracks visitors, views, conversions, and conversion rates. All pages automatically include Google’s Page Speed best practices to ensure your pages load fast. Allows users to sign into Unbounce easily using an email address assigned to your business. We will cover the full package of security features further down the review. The features above are offered on all plans. However, Premium and Enterprise plans offer a few additional features. Most of these are overkill for smaller businesses but are worth keeping in mind as you scale. Additional published landing pages; up to 150 for Premium and 375+ for Enterprise accounts. Additionally published popups and sticky bars, up to 16 for Premium and 40+ for Enterprise accounts. Client sub-accounts, so you can easily manage multiple clients. Additional integrations with Marketo and Salesforce. Advanced targeting for pop-ups and sticky bars. What Else Do Enterprise Customers Get? A ticket to Unbounce’s annual CTAConf (Call to Action Conference). Data security is a huge deal for online businesses, and it is nice to see a company take it seriously. Unbounce has a solid set of protective attributes in place to keep you and your visitor’s data secure. Enterprise customers have access to additional features, which are noted in the list below. SSL Encryption: All Unbounce pages display the lock icon in the URL bar and use HTTPS to keep data secure. GDPR Compliance: All pages are designed to be GDPR compliant. IP Filters: Filter out IP addresses you know so you can view your pages without messing up your tracking. Also helps keep conversion data clean and accurate. 2 Factor Authentication: Requires a trusted device in addition to a single password. For Enterprise customers only. Audit Logs & Automatic Backups: Again, only for Enterprise customers. Unbounce has a ton of self-help resources in its Help Center. Documentation is split by topic, including Getting Started, Integrations, Community, and Ecourses. The search function doesn’t work particularly well. I was able to find answers to my questions, but they were often buried in the search results. For example, when I searched “how to add a facebook button,” the answer was not easy to locate. But at least it was there! You may need to stay sharp to find solutions to your queries. Support is offered Monday through Friday during “business hours,” but there is no indication if that is Pacific time, Central European Time (for their Berlin office), or both. 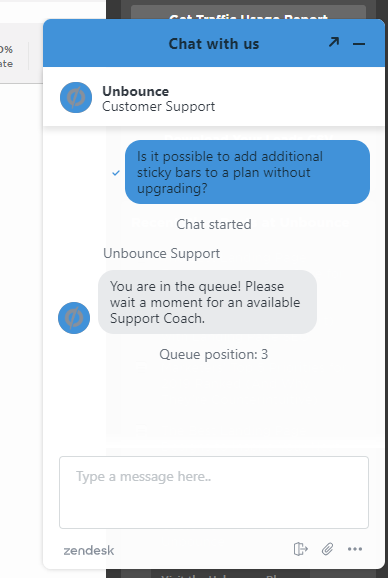 I tested the live chat support. After typing my question, I was told where in the queue I was, which I appreciated. I moved through the queue quickly – it took about six minutes to get a live person through chat on a Monday at 2 pm in the afternoon. The support person pulled up my account and was able to answer my question in about two minutes. And, for what that is worth, you can buy a la carte 5 packs of Sticky Bars and popups. Now that you’ve seen the entire picture, let’s talk about where Unbounce stands out and where they fall short. Instapages is slightly more expensive (starts at $99 a month on their yearly plan) but offers more than Unbounce’s base plan. Get access to more analytics, 200+ templates, 40 integrations, and more. If Unbounce’s Essential plan wasn’t quite enough, but the Premium is too expensive, this is a solid choice. LeadPages is a much more budget-friendly option, starting at just $25 a month for unlimited lead pages, popups, and alert bars. It also offers 40+ integrations, A/B testing, and 200+ templates. The builder is slightly less robust and support is by email only. Still, it is a competent and budget-friendly option. If you use WordPress, you might also consider Beaver Builder or Elementor. Got more questions about Unbounce? Here are the most-asked questions about Unbounce’s landing page builder. Can you add countdown timers to your landing pages? Yes! This is a newish feature to Unbounce. You can now add a sense of urgency to your landing pages by telling users when the deal will expire. Can I add on extra landing pages, sticky bars, or popups to my current plan or do I have to upgrade? Yes, according to support you can add sticky bars and popups a la carte. It is not clear if you can add more landing pages. Does Unbounce offer a free trial? Yes, they offer a free 30-day trial so you can test out all the features before you buy. Overall, Unbounce is an easy to use tool for small business owners who want to increase conversions online. It is also worth noting this is a full-featured tool that will adapt and grow with your business, not a stop-gap measure to just get you by. You can build a totally customized landing page from scratch in less than an hour, circumventing the need to work with a developer. Or, you can use an Unbounce template and be up in running in just a few minutes. You are here: Home > Marketing Tool Reviews for Small Business > Unbounce Review: Best Landing Page Builder in 2019? Previous: Hubspot Review: Can They Really Sort Your Firm’s Marketing Needs? We Find Out. Next: Is Adzooma Right For Your Small Business?